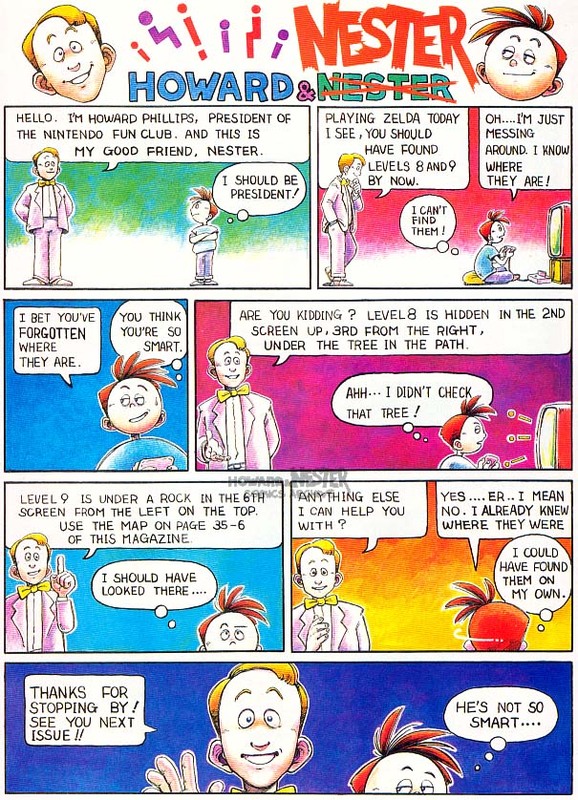 Anyone who has read Nintendo Power since its beginning has, obviously, at least glanced at the little comic strips in a couple of pages of the magazine called "Howard & Nester", which chronicled the adventures of bowtie-wearing Howard Philips (who was an actual employee of Nintendo and president of the Nintendo Fun Club at the time) and a stubborn redheaded teen named Nester. 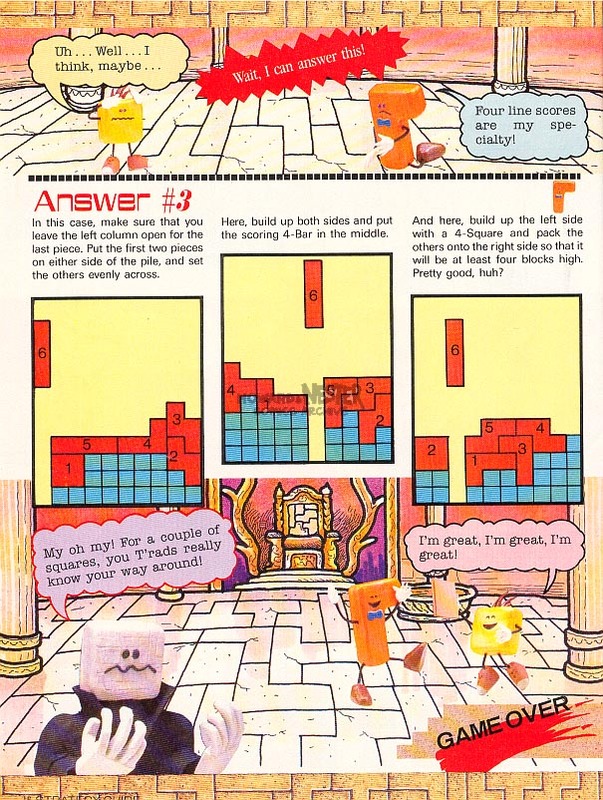 Together, the two ventured into the worlds of various NES games, gave us a couple of thinly-veiled legitimate tips, and always provided a little bit of humor for us all. 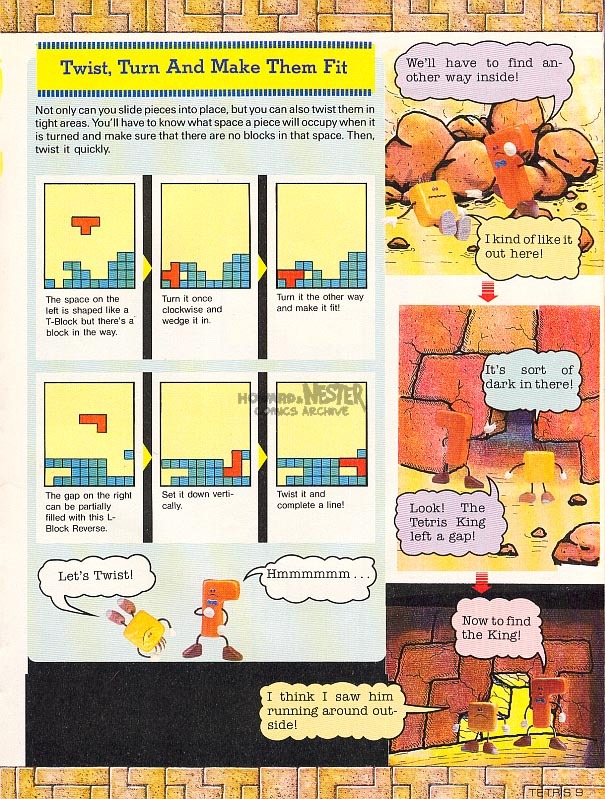 In Volume 25 of Nintendo Power, Howard left the magazine to pursue other goals (JVC?! 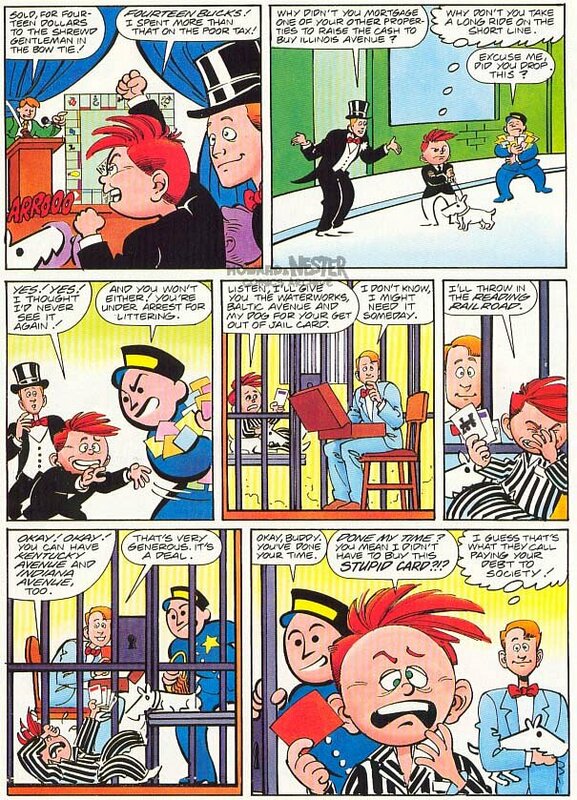 I'll bet that worked out well), and left Nester to star in a series of comics of his own. 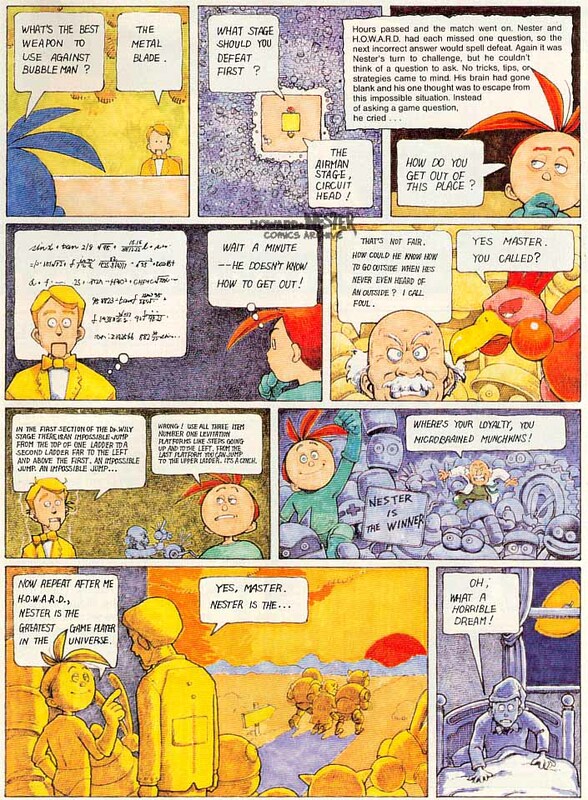 But a few years after, all traces of Nester (and Howard) vanished, and left the magazine to wilt away. 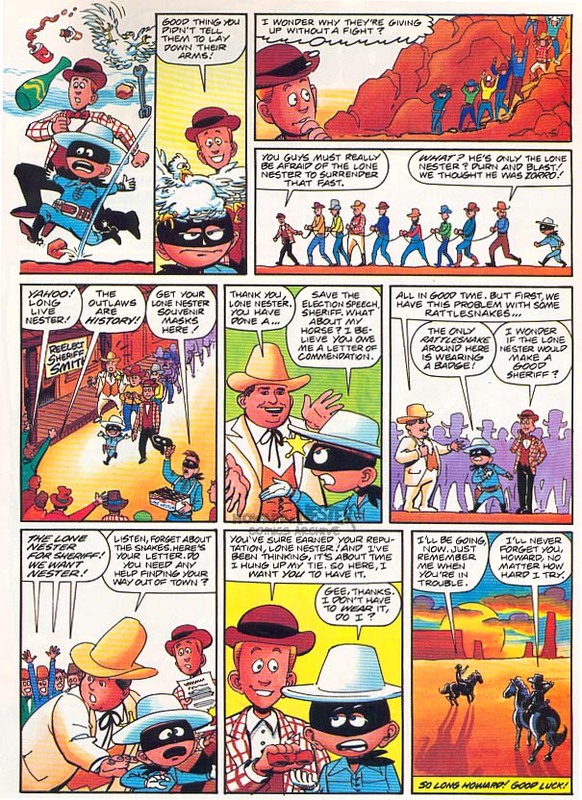 All 21 installments of Howard & Nester are here, along with a few bonus comics thrown in for good measure. 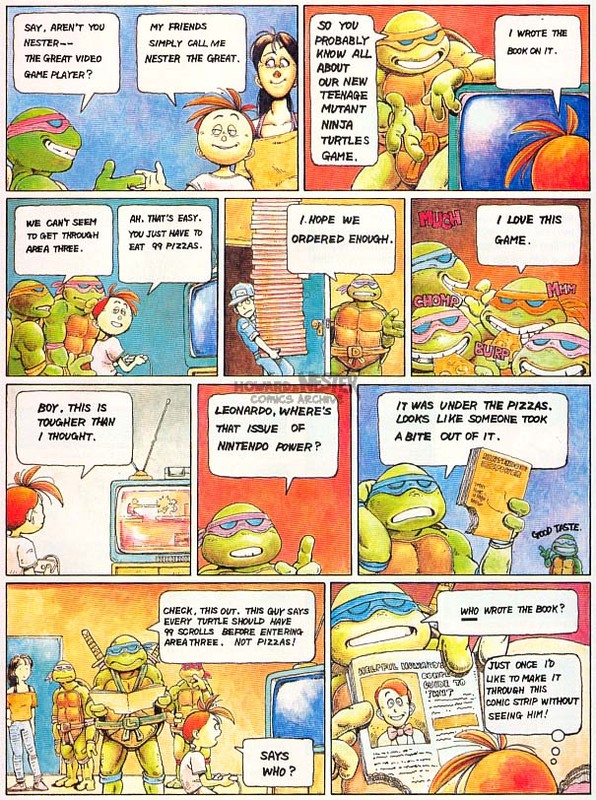 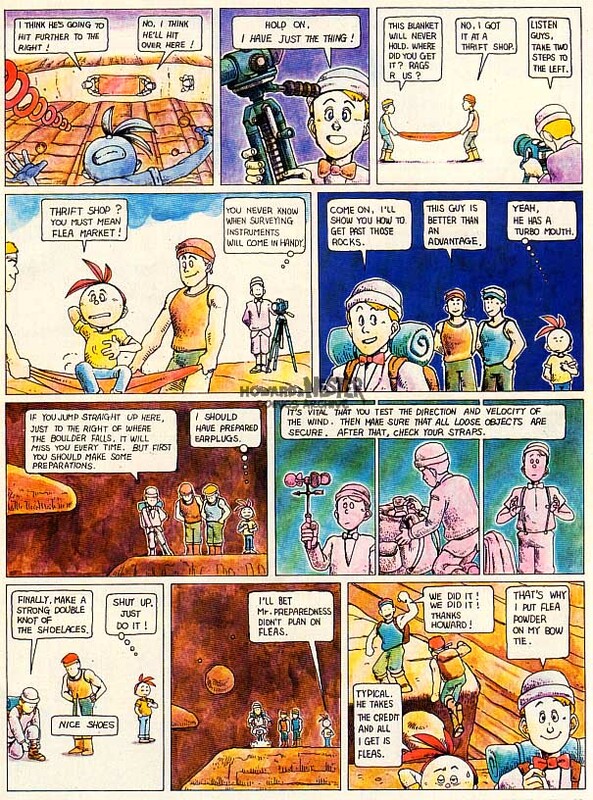 The first issue of Nintendo Power introduces our two friends in a one-page comic. 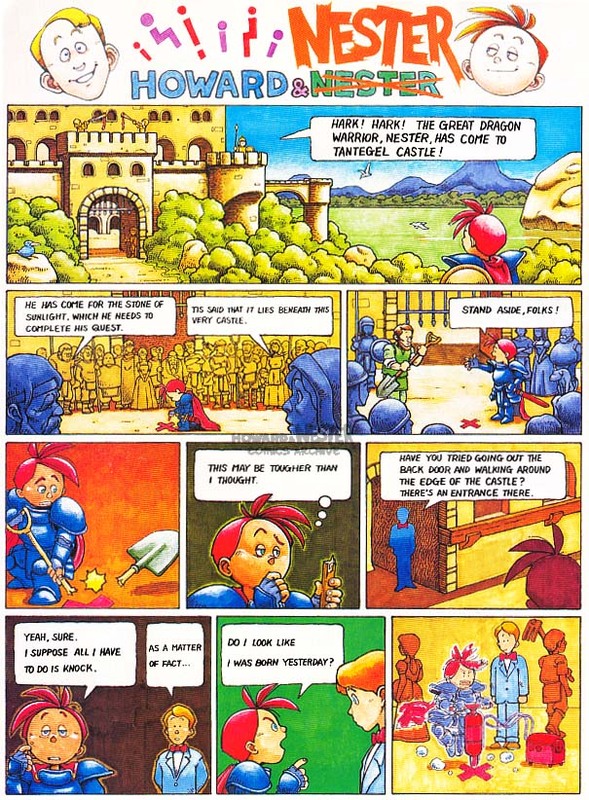 Nester valiantly shows off to a group of kids until Howard appears with an issue of NP and spoils his fun. 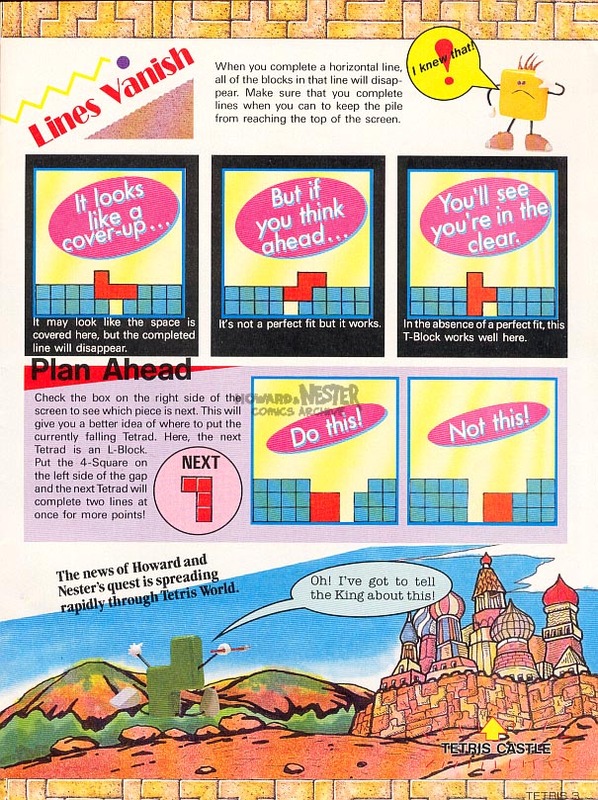 Aside from moving to two-page comics, Howard & Nester also started to use the settings of the featured games in the magazine starting with this issue. 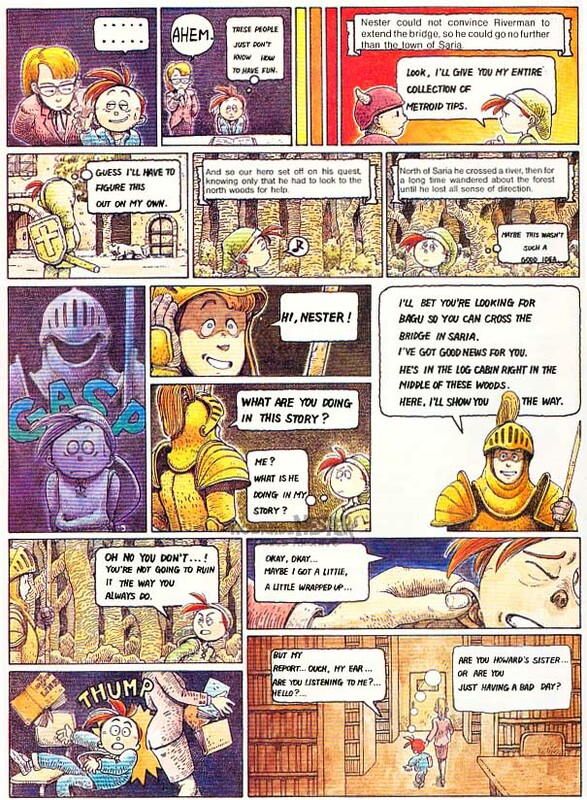 Here, Nester (in full Belmont regalia) leads a couple kids trying to get through the game's Bodeley Mansion, and wouldn't you know it, Howard pops in. 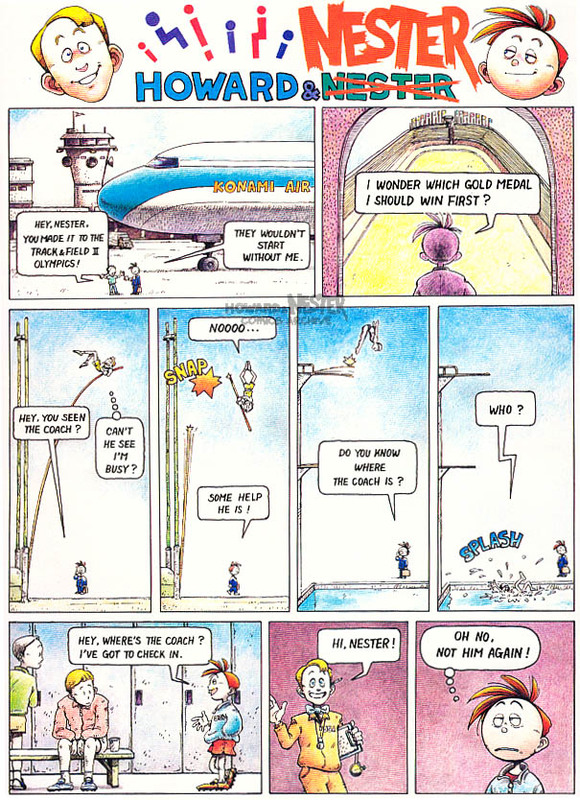 Nester has dreams of competing in the Track and Field II Olympics. 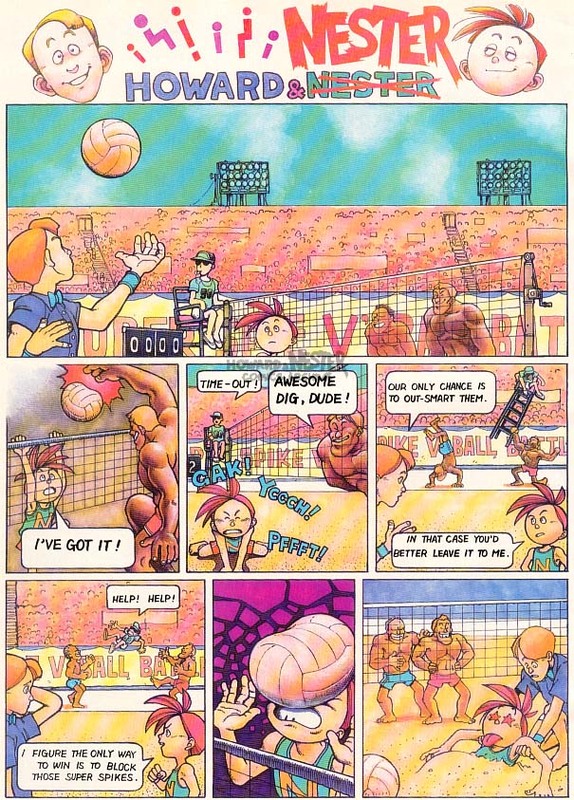 His dreams are quickly shot down once he discovers his coach is none other than Howard. 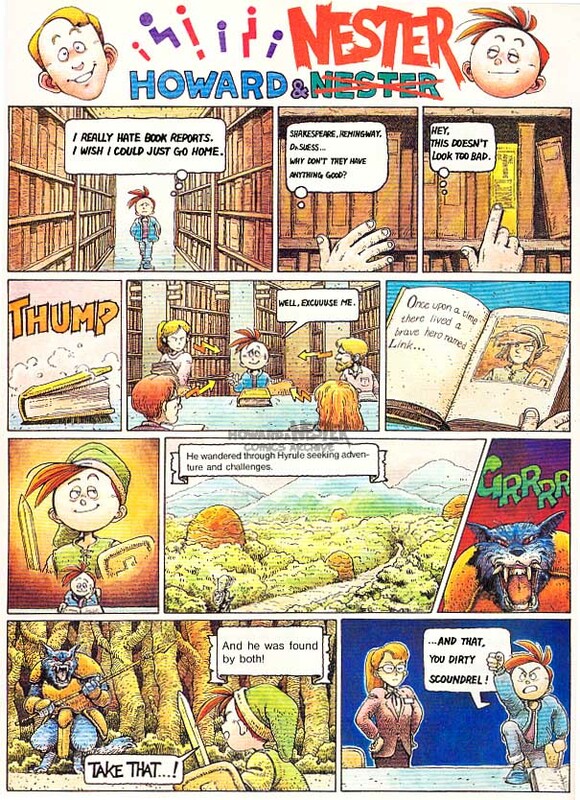 Nester happens upon a book in the library that tells the story of Link. 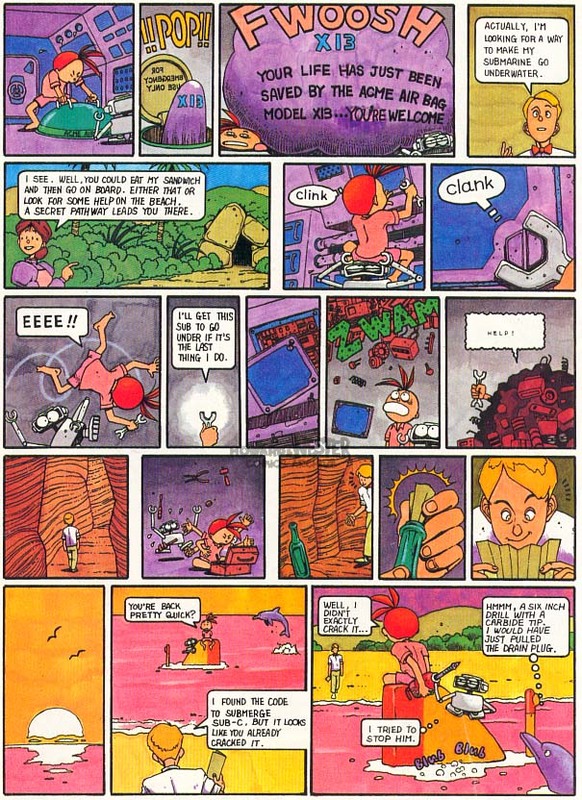 Nester becomes too wrapped up in the story, and Howard invades his daydreams. 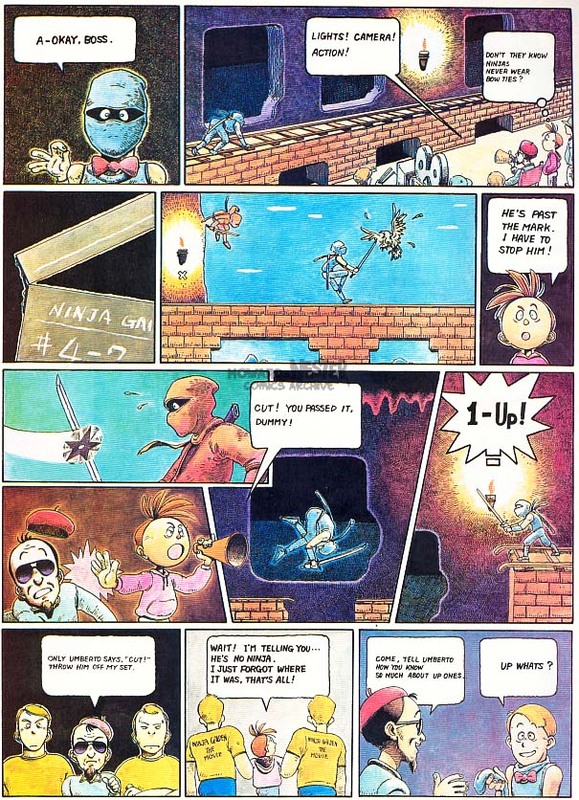 Nester visits the set of the Ninja Gaiden movie. 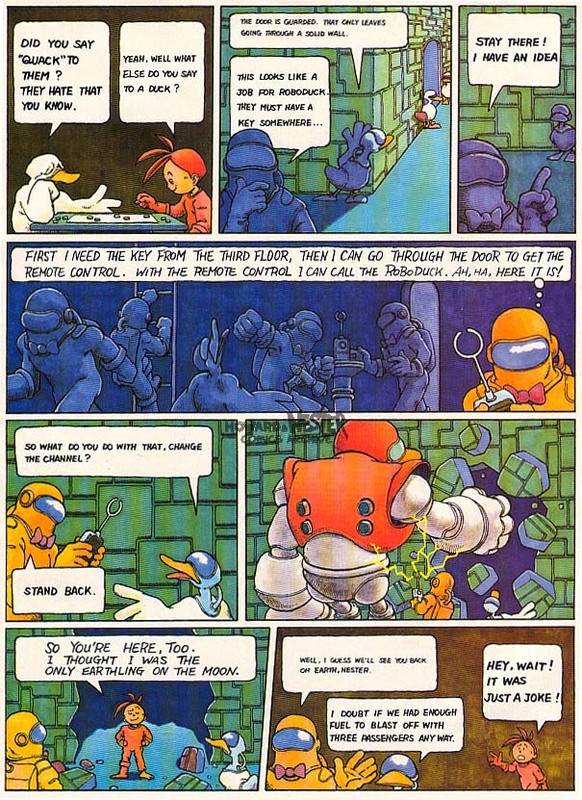 After witnessing the (somehow familiar) main hero blindly miss a 1-Up, Nester takes over as director. 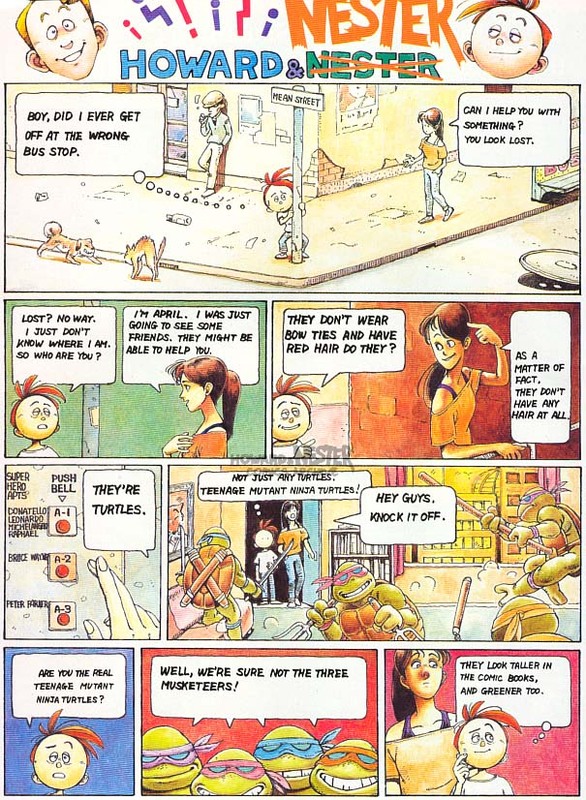 Nester is lost on the streets, but a young woman named April invites him to her apartment and introduces her four green friends, who happen to need help getting through their own game. 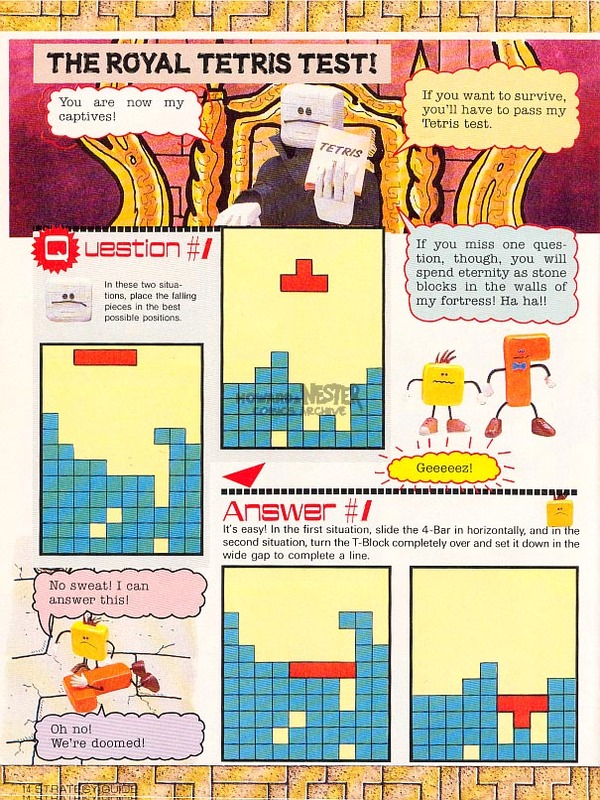 The story of robotic hero Nester in an MM2 trivia competition against Dr. Wily's latest evil, bowtie-wearing creation. 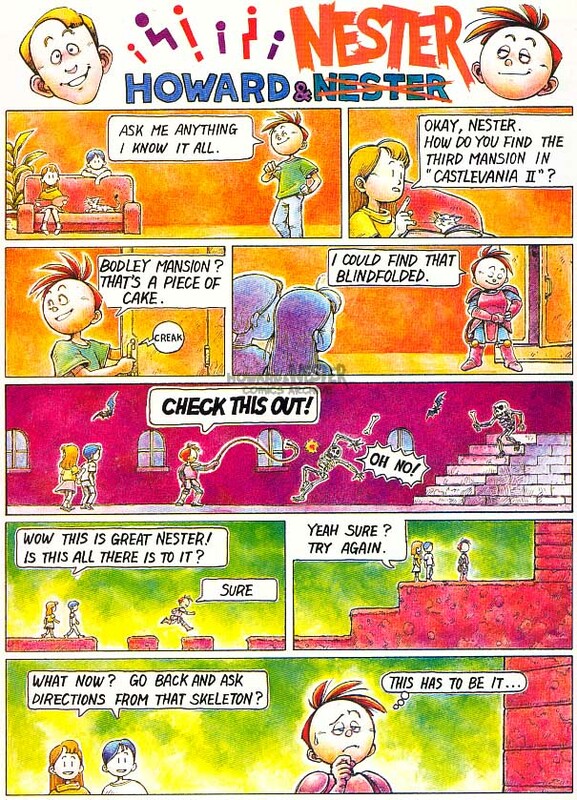 And...Nester wins?! 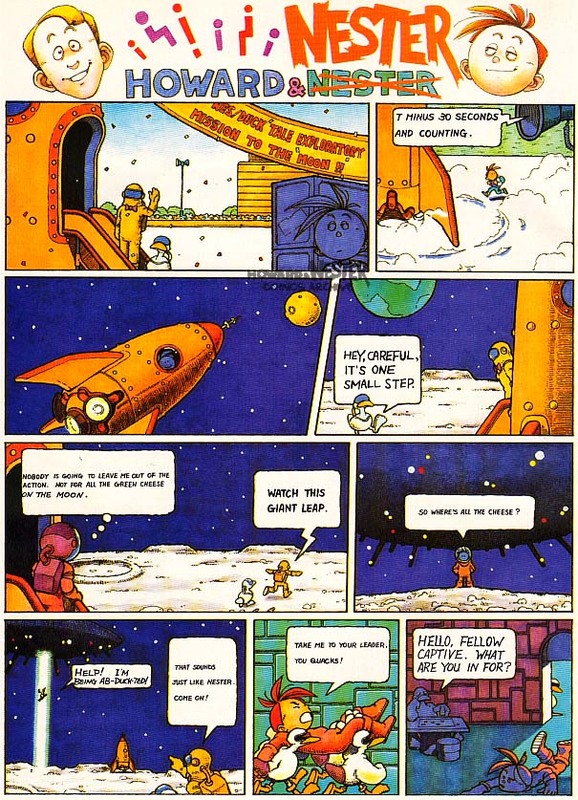 Howard and a duck companion travel the moon's surface, and find Nester trapped in an outer space prison. 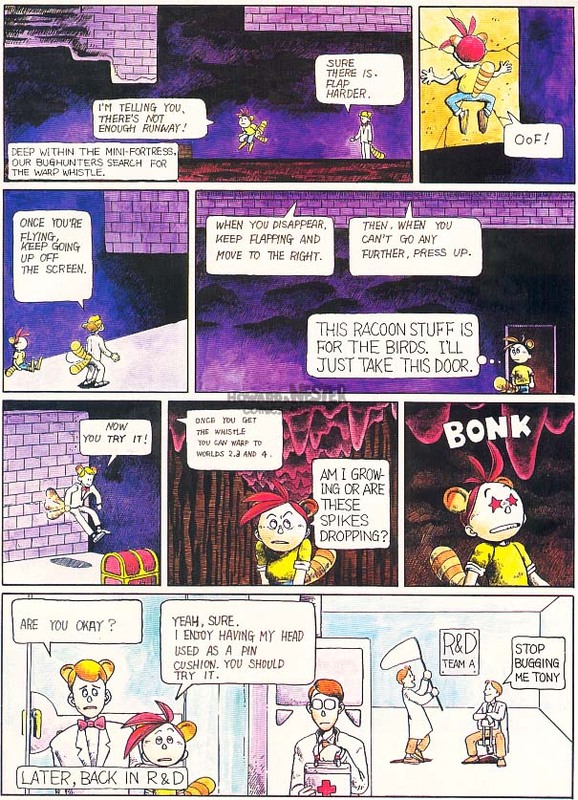 Brave warrior Nester fails horribly while trying to break into Tantegel Castle. 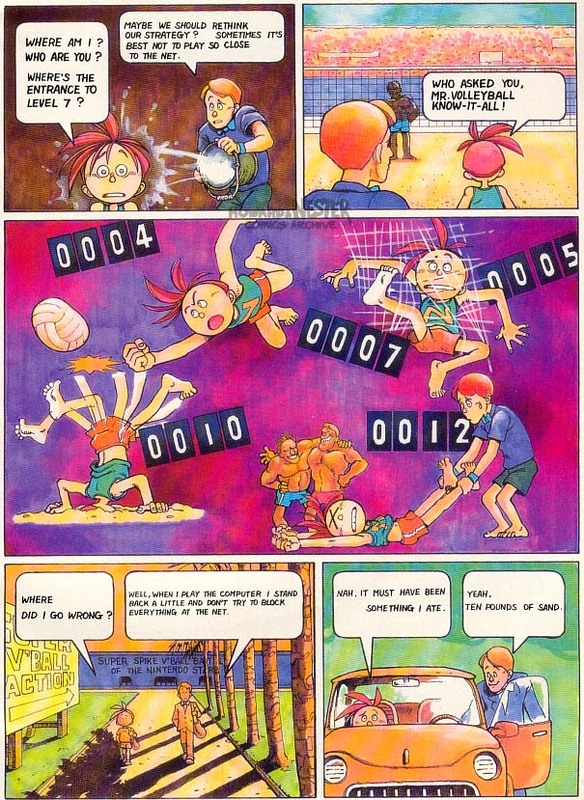 Howard and Nester engage in a game of volleyball against a couple of beefcakes, and Nester frequently becomes one with the ball. 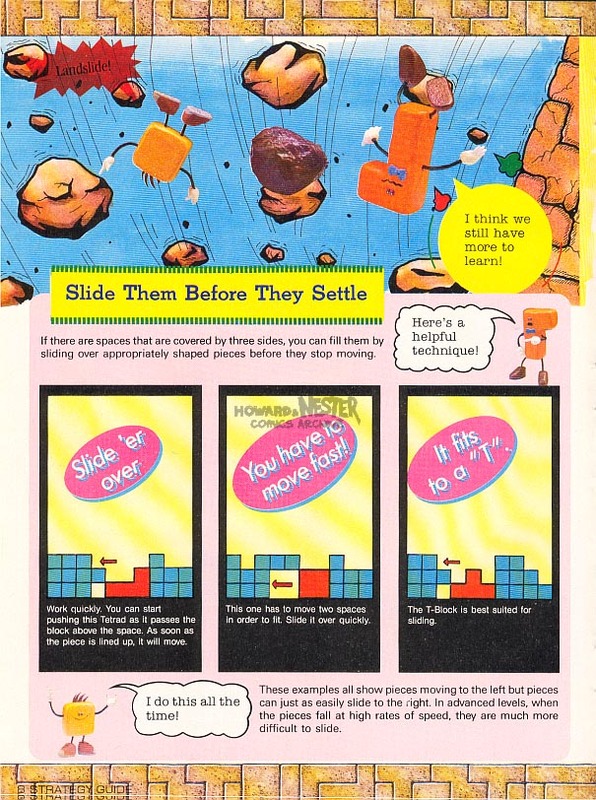 Howard and Nester are dispatched to eradicate bugs in Super Mario 3. 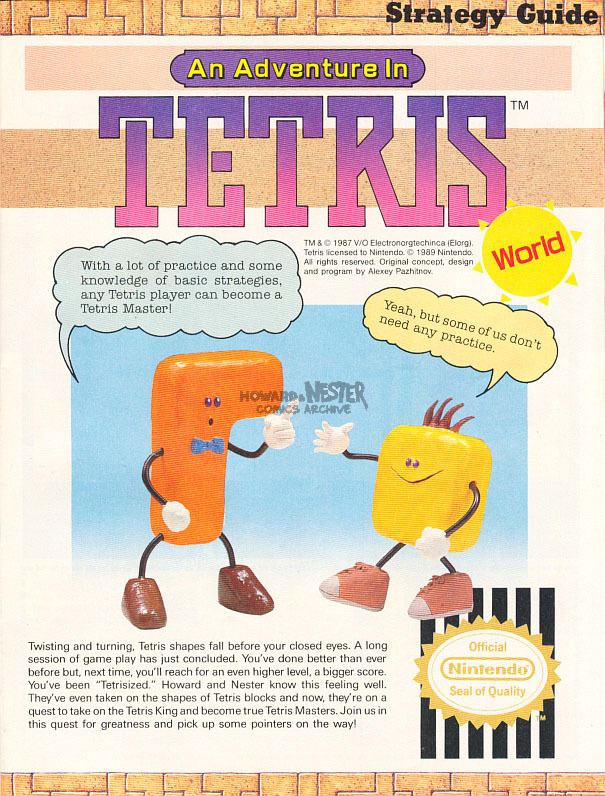 Immediately they don raccoon ears and tails and are beamed into the game as Nester tries valiantly to obtain the first hidden whistle. 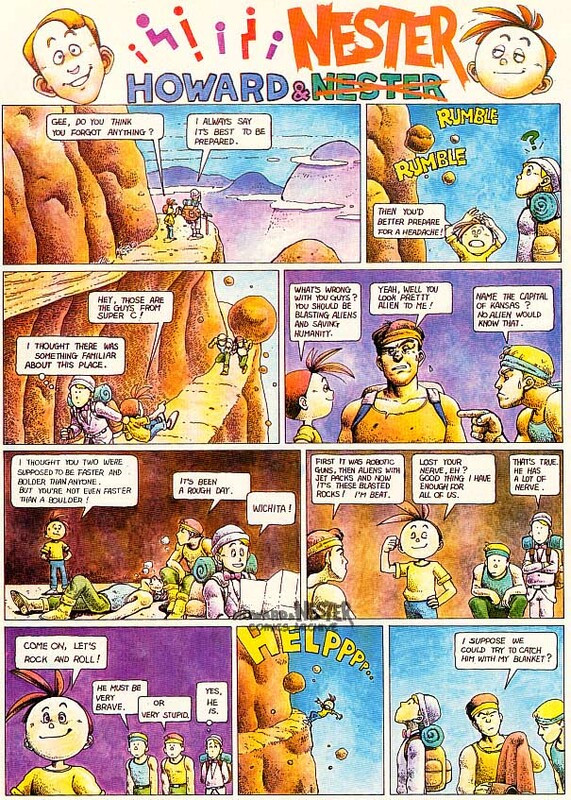 Howard and Nester meet up with "the guys from Super C" and try to help them cross the dangerous boulder-ridden mountain. 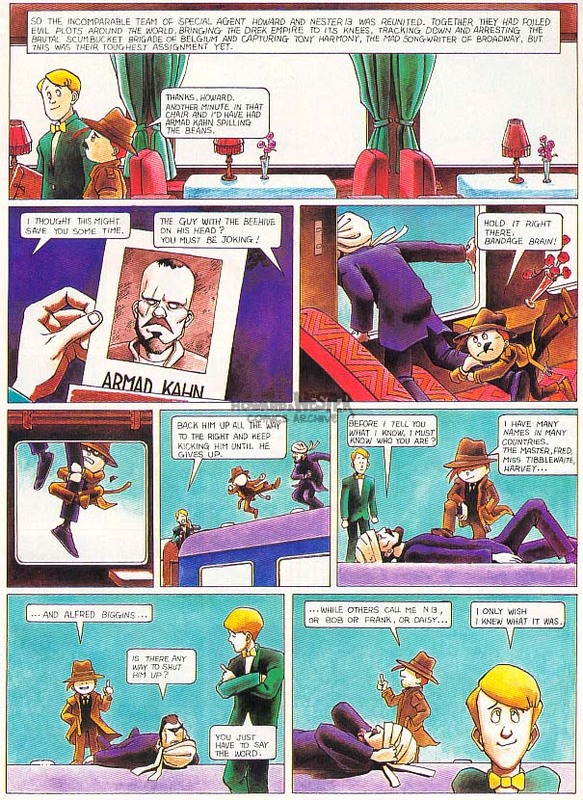 Nester is in pursuit of Armad Kahn, a Mafat informant. 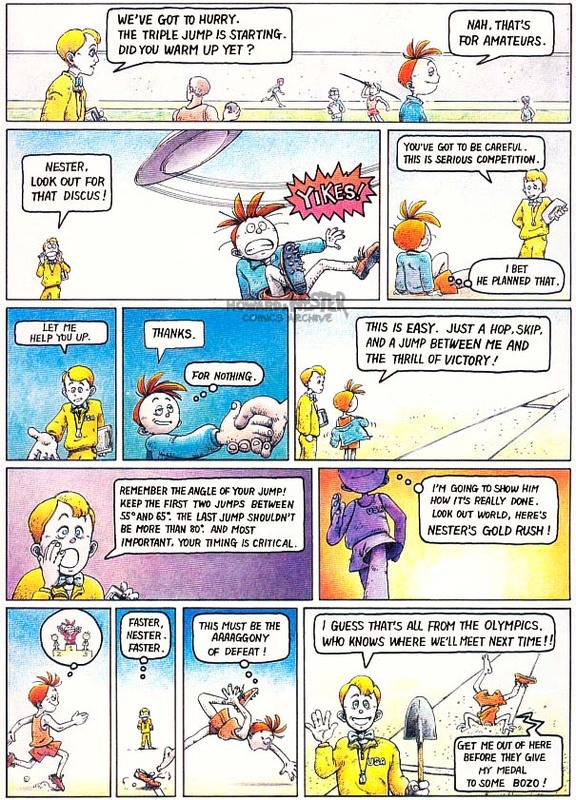 After some failed sleuthing, Howard finally points Kahn out, and Nester is quick to defeat him. 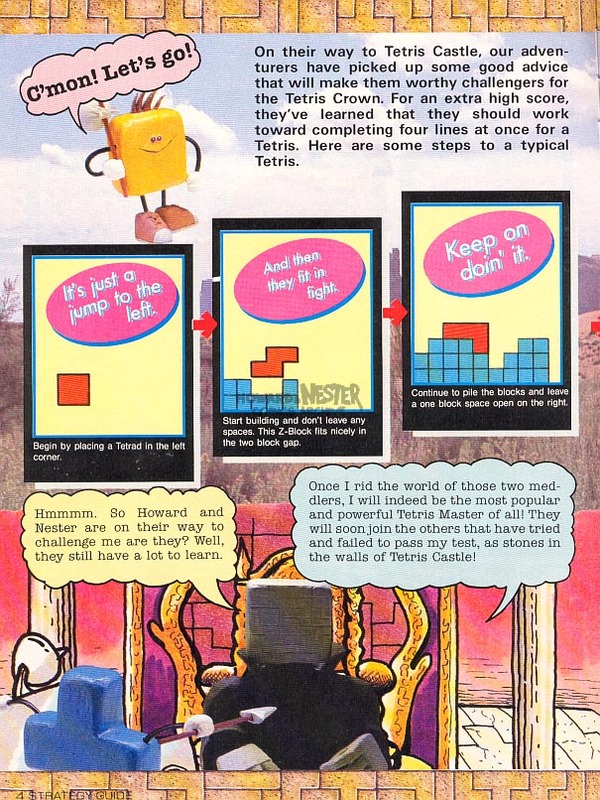 Razor joins Howard and Nester as they explore the Maniac Mansion. 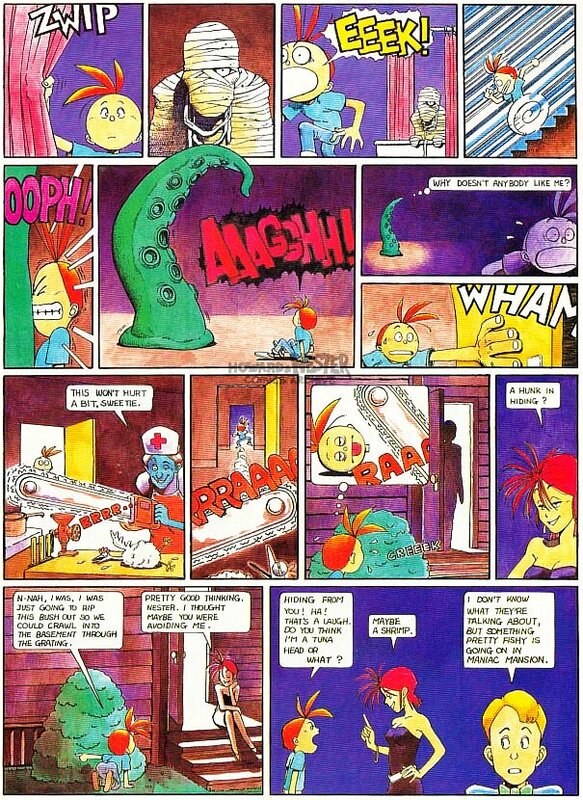 Yes, this has the tentacle. 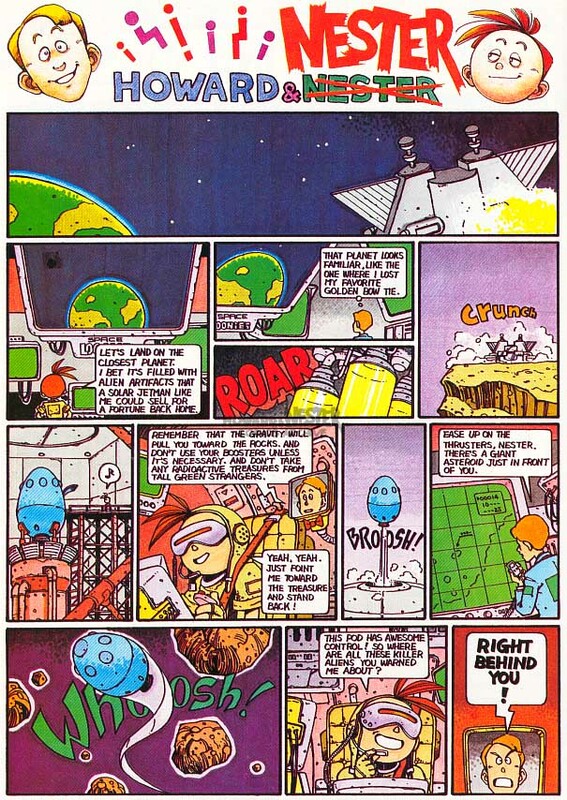 As an official Solar Jetman, Nester is sent to explore a mysterious planet, whose inhabitants worship...?!? 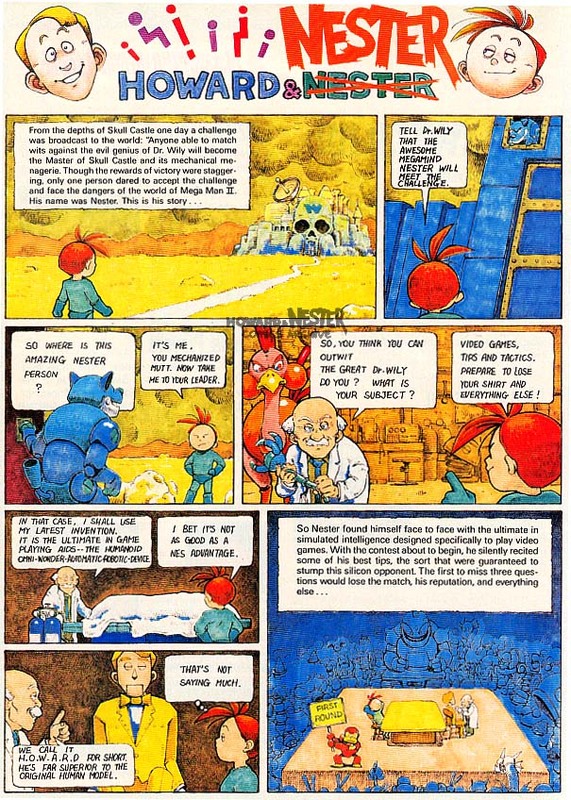 Howard, Nester and Rush traverse Dr. Wily's castle. 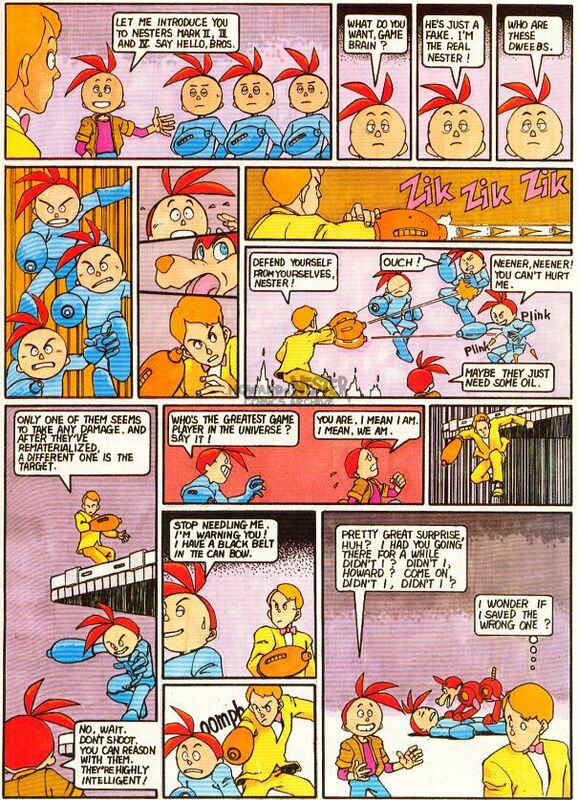 After being attacked by a couple of lethal robots, Nester introduces his three "brothers," who are more like evil, evil clones. 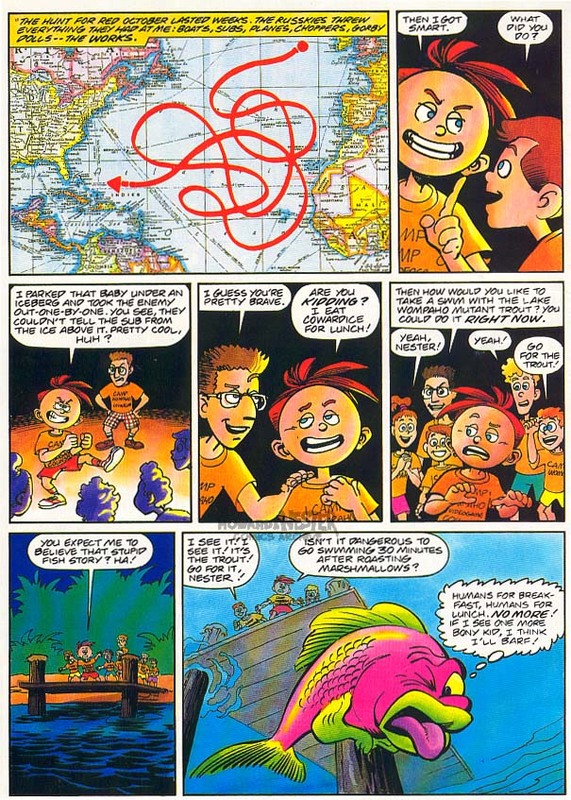 Howard and Nester are stranded in the tropics, trying to get Sub-C to submerge. 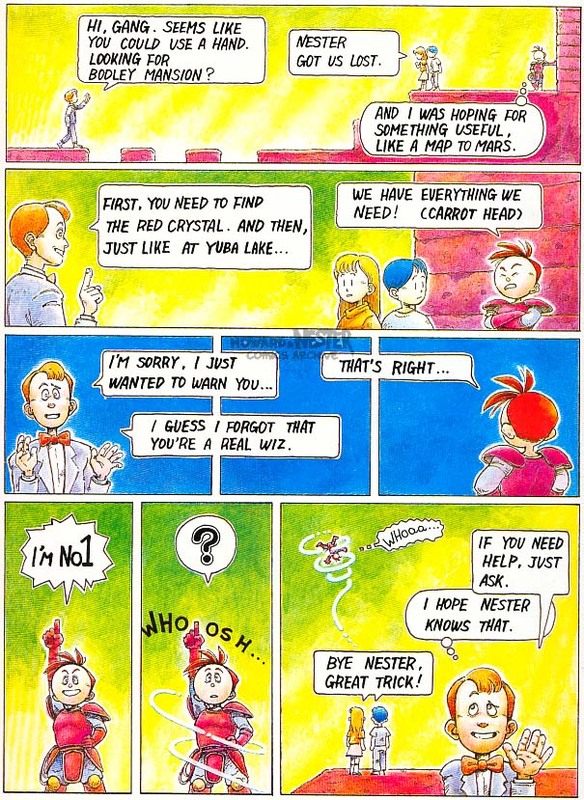 Howard asks around for help while Nester tries to fix the sub the old-fashioned way. 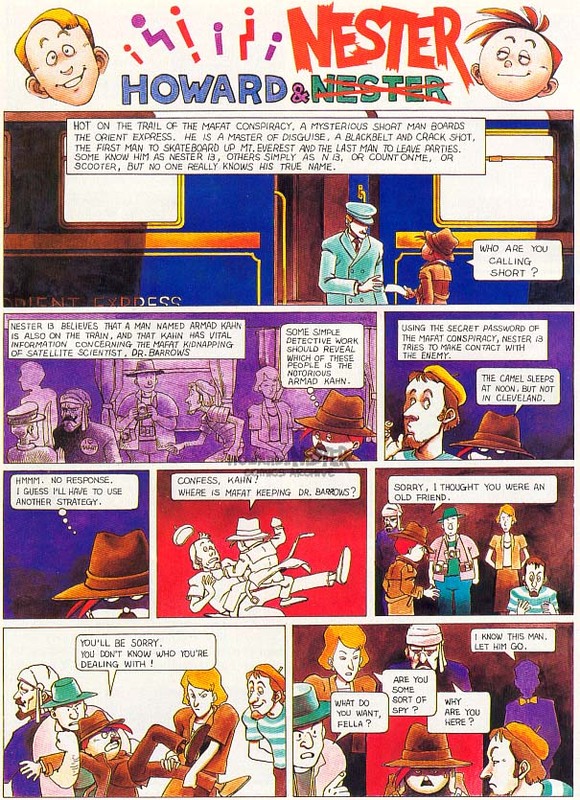 The role of the amnesia-stricken detective falls upon Nester, and Howard tries to help him regain his memory, in some odd way. 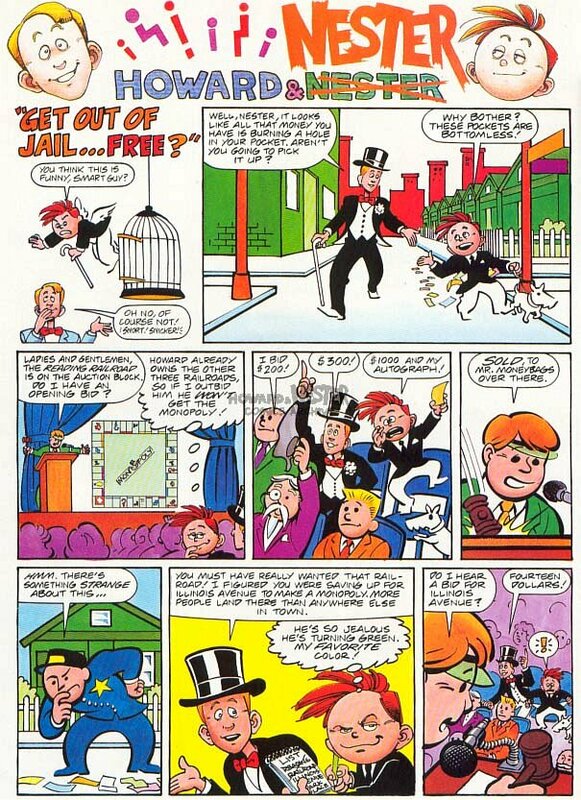 As Uncle Moneybags, Nester spends irresponsibly and ends up losing his entire fortune. 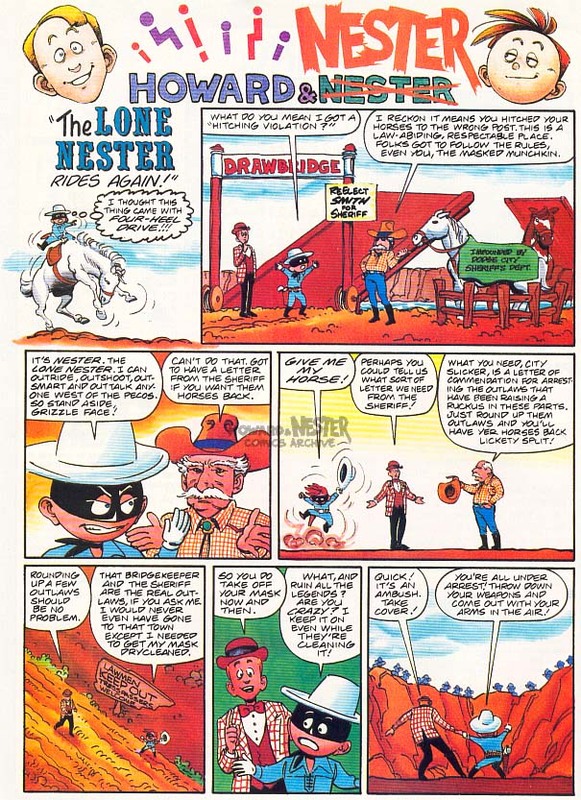 The Lone Nester tries to recover his prized horses by apprehending an entire gang of outlaws. 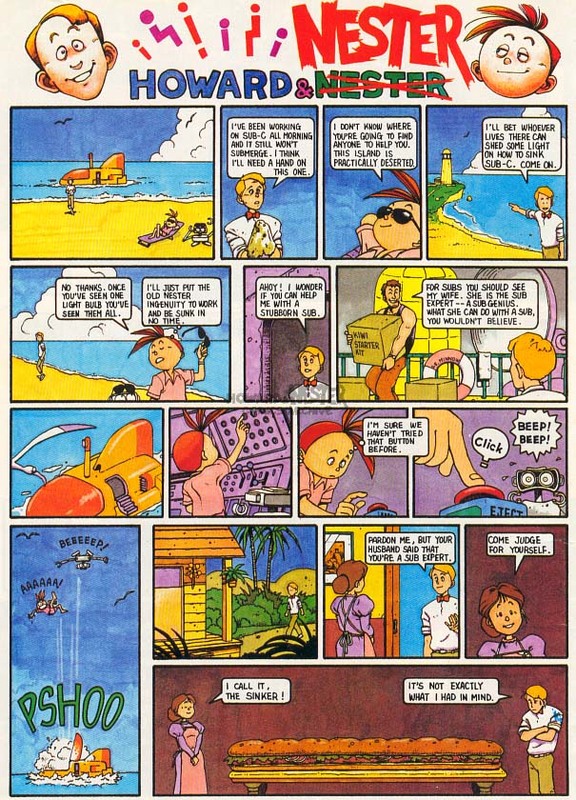 Once that's said and done, Howard decides it's time to go seperate ways. 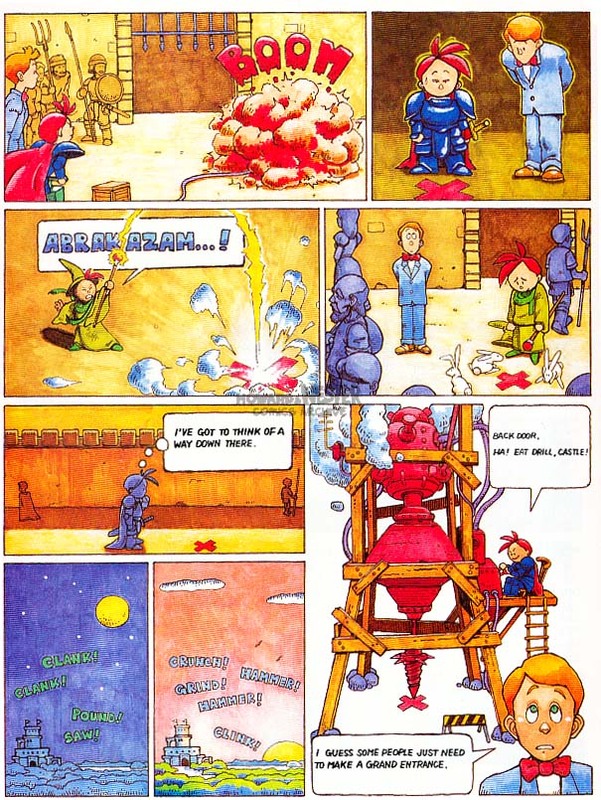 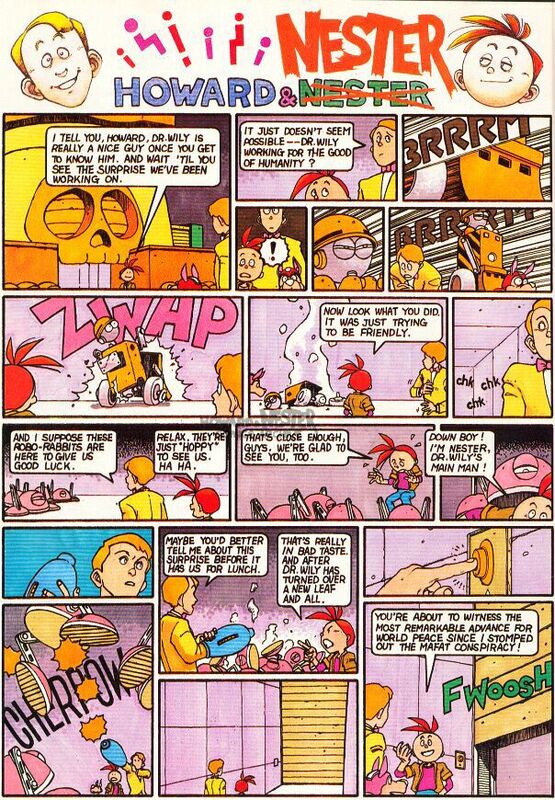 Bonus Comics Howard and Nester (well, mostly Nester) have appeared in the pages of Nintendo Power other than in their own comic. 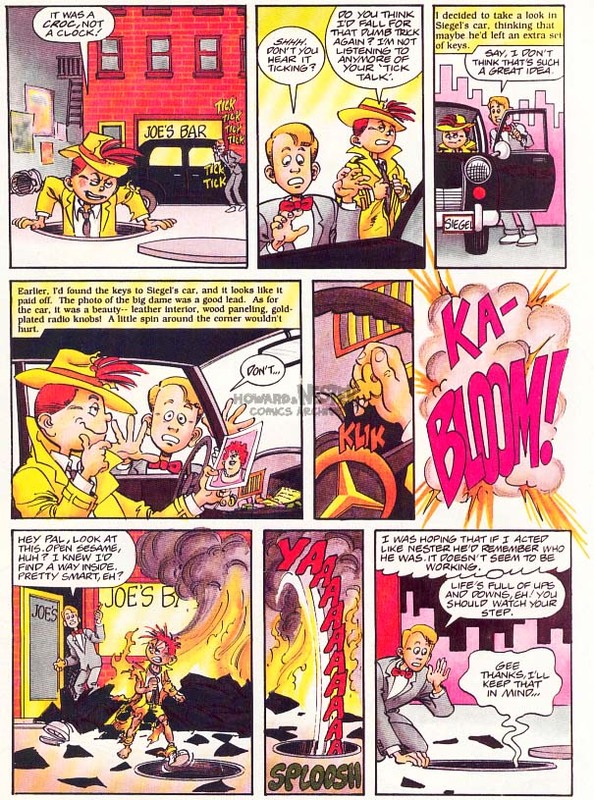 Here's a selection of some other escapades they've engaged in. 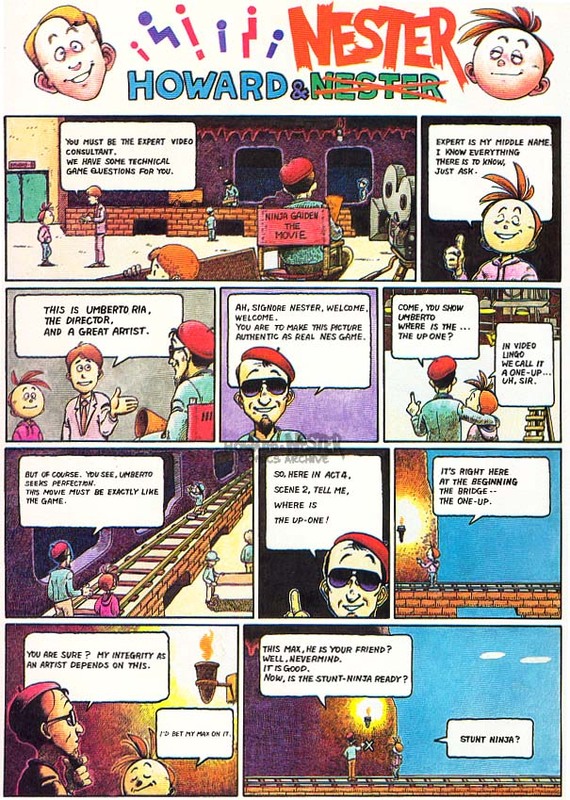 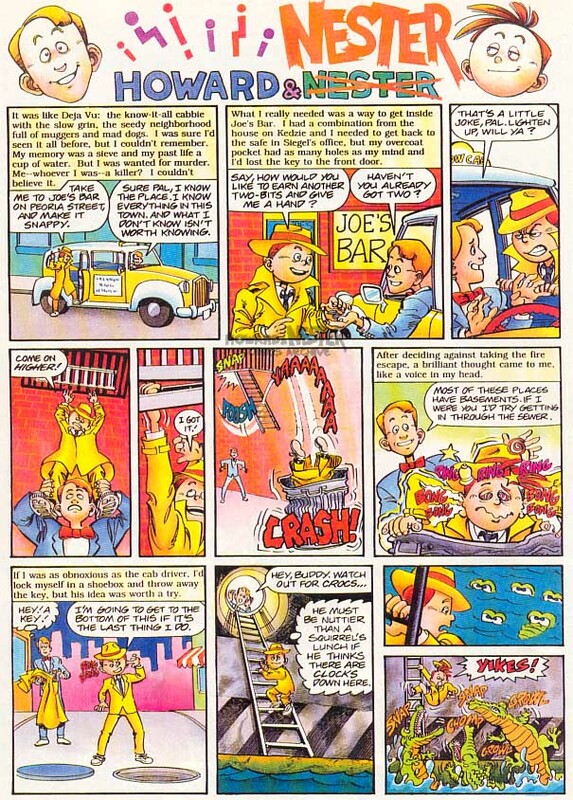 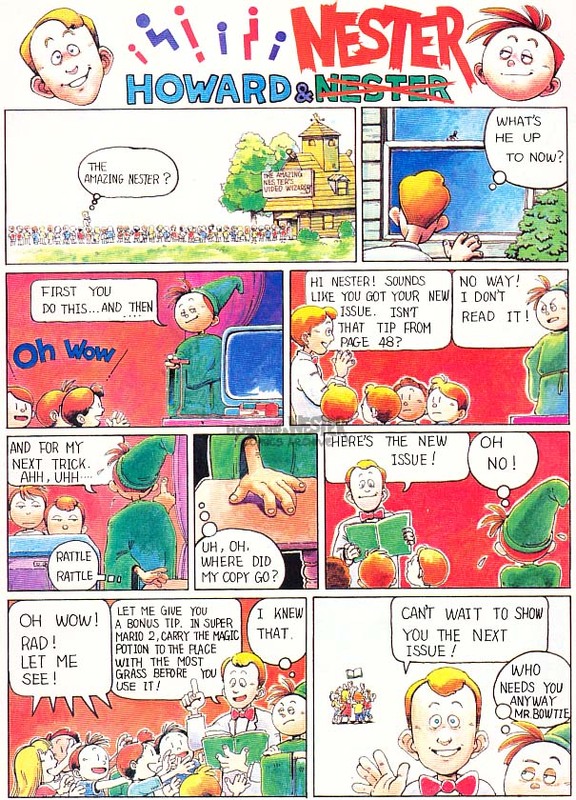 After Howard left the magazine, Nester began starring in his own comic. 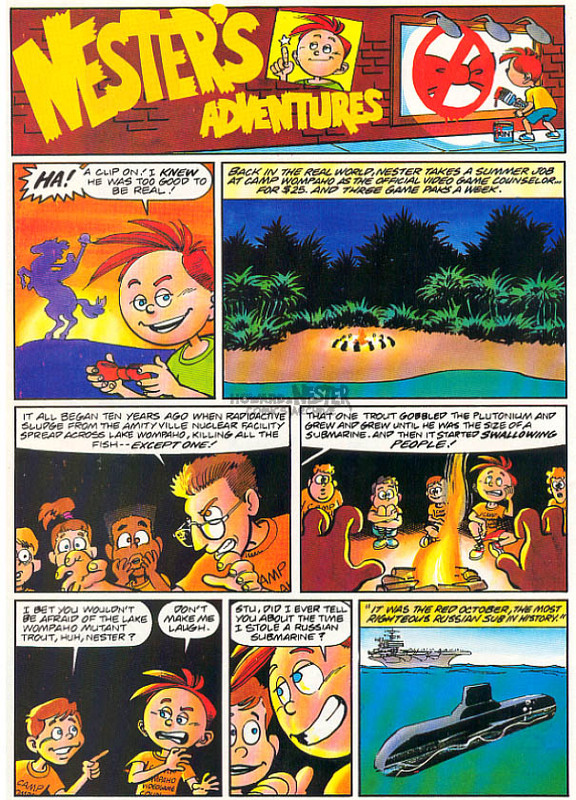 This is the first episode of many more, where Nester (here a camp counselor) tells the story of his mission to recover the submarine Red October. 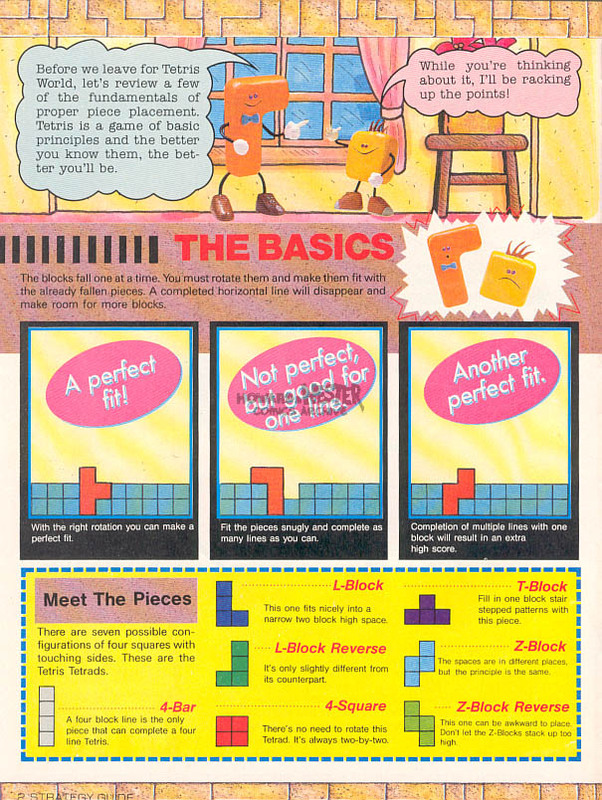 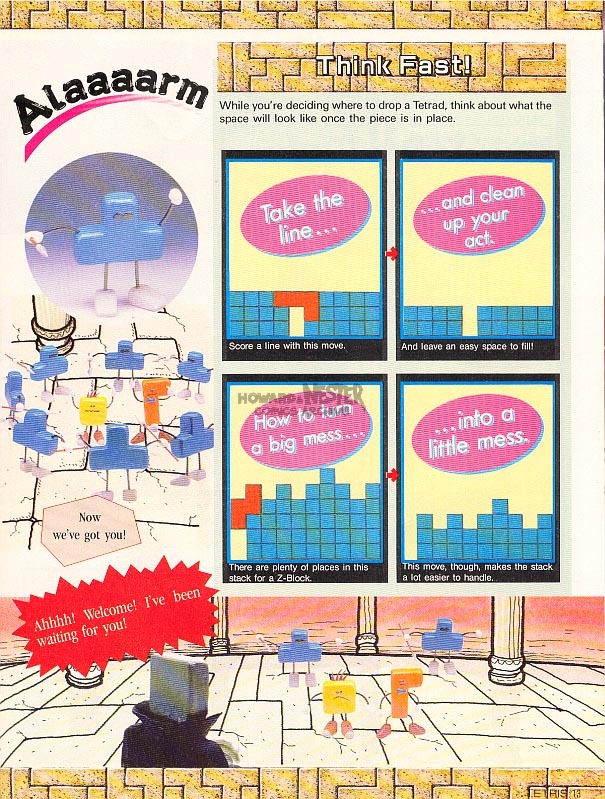 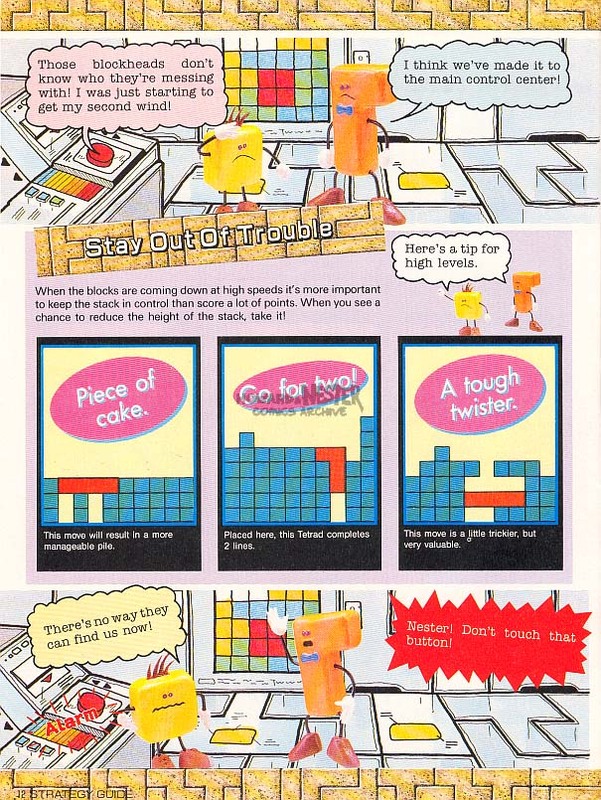 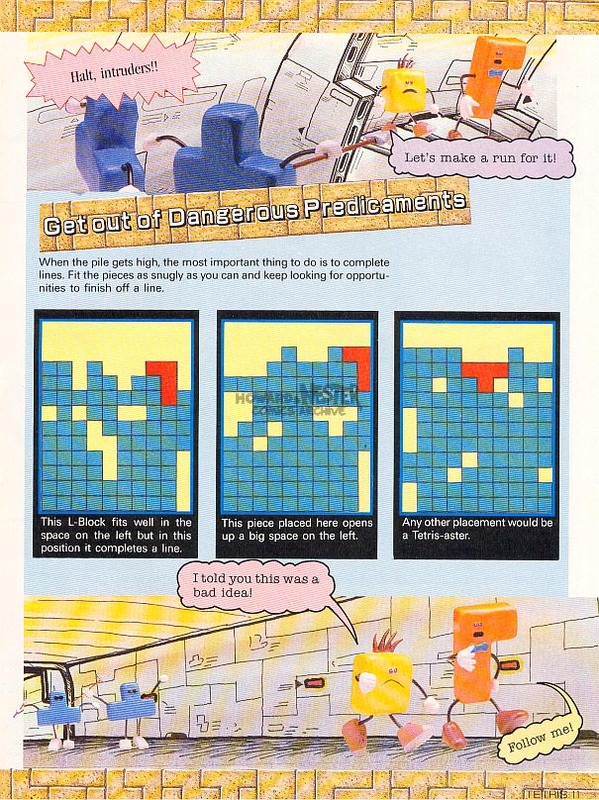 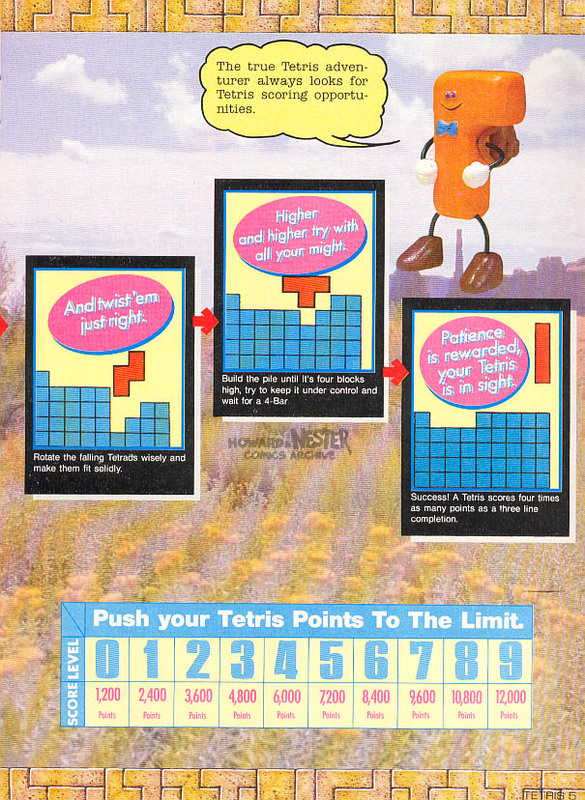 Howard and Nester are clay Tetris blocks in this multi-page story that ran in between a mini strategy guide for Tetris. 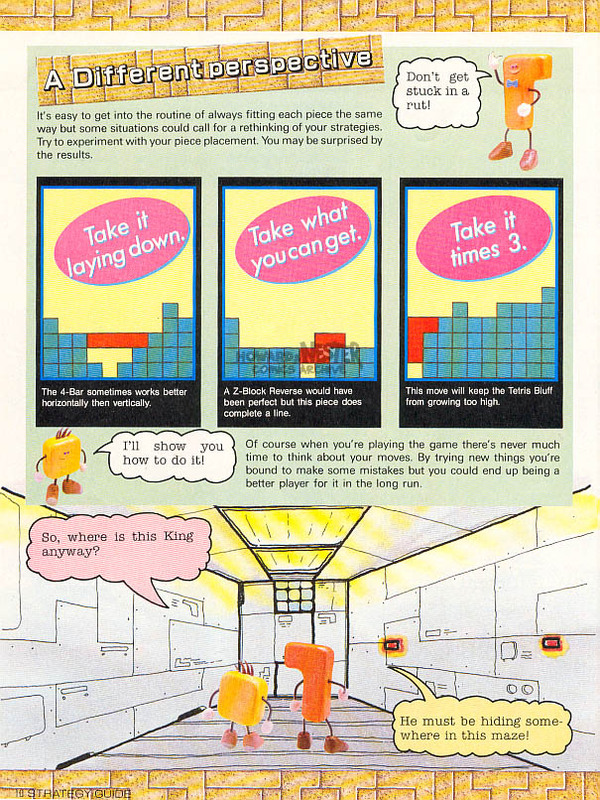 These three short comics ran along the bottom of a Nintendo Power feature about Nintendo's then-upcoming Game Boy system. 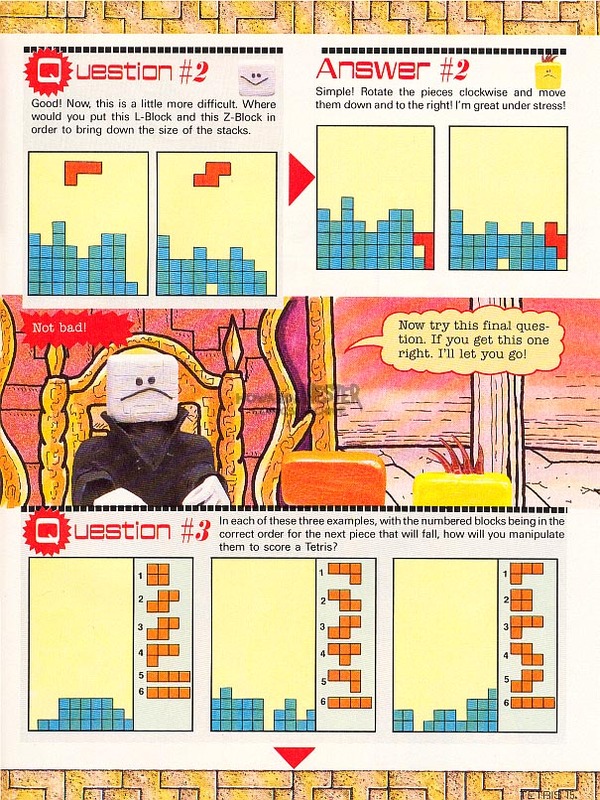 In the first, Nester jeopardizes a crucial game of Tetris. 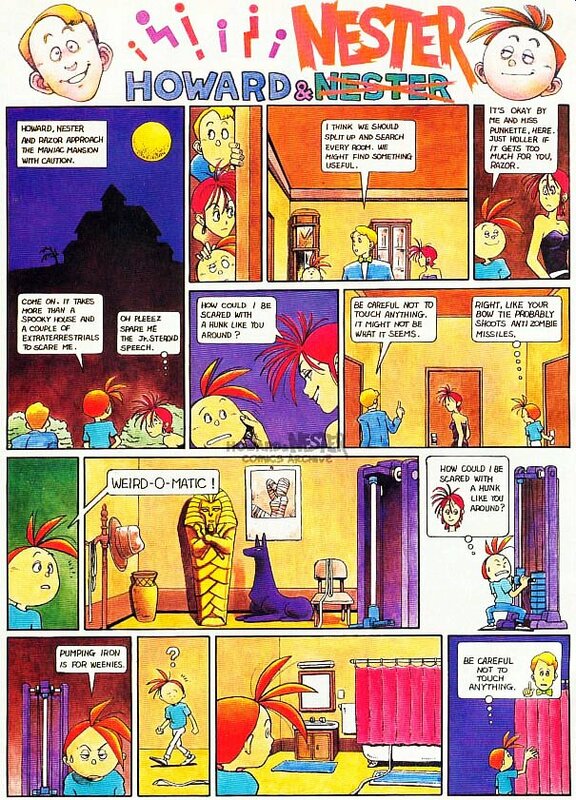 Next, Nester's mom (!) 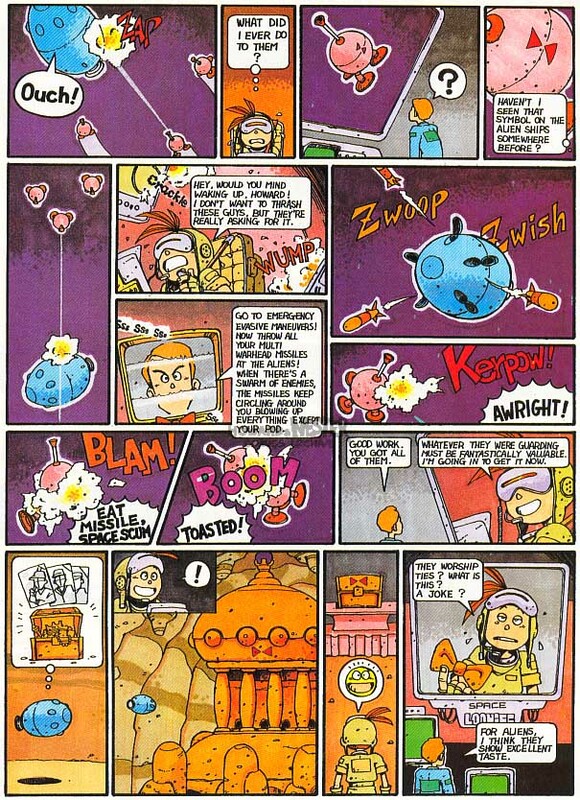 becomes a slave to the world of Game Boy, and finally Howard challenges Nester to a Game Link battle. 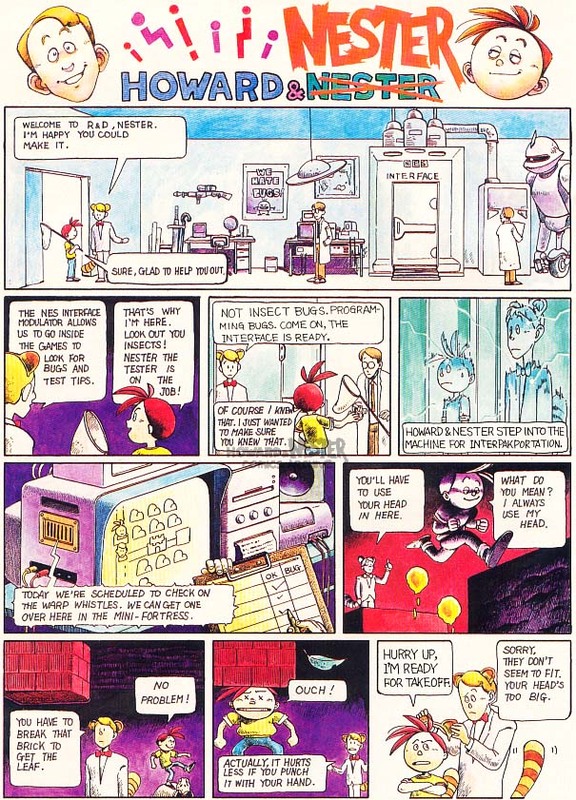 Wow, my scanner really hates blues and purples.